From Buddhist monks of Koyasan to the high rollers of Tokyo, capture the many faces of Japan on this condensed tour beginning in Osaka. Savour the region’s culinary delicacies and the beautiful views at Mt Fuji. You'll stay in a traditional ryokan and really soak up local culture in onsen hot springs. A great combination of included activities and free time, this adventure provides a taste of the rich culture of Japan. Day 1 Osaka: Arrive at any time. 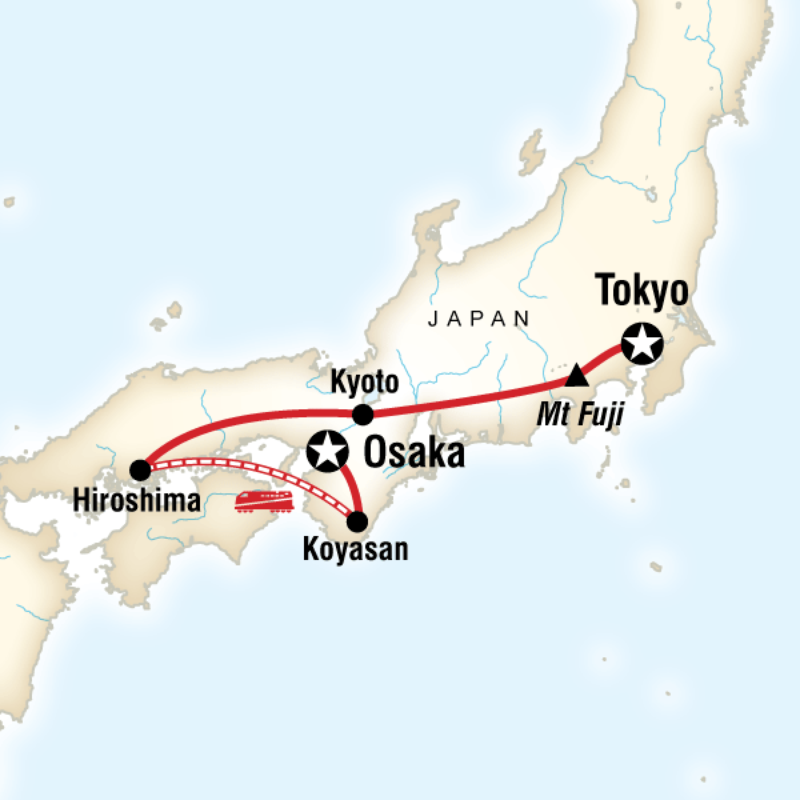 Day 2 Osaka/Kōyasan: Visit the Centre of Buddhism in Japan and sleep in a temple atop the 800m Mt Koya. Savour a traditional dinner of shojin ryori (Buddhist vegetarian cuisine). Watch the monks pray in the morning. Day 3: Kōyasan/Hiroshima-shi: Watch the monks pray in the morning before traveling to Hiroshima. Day 4: Hiroshima-shi Visit the Peace Park and Museum and take a ferry ride over to the sacred island of Miyajima to see the famous floating Torii gate. Day 5: Hiroshima-shi/Kyoto Travel to Kyoto and start exploring. Day 6: Kyoto Visit the impressive Nijo Castle and gardens along with the famous Kinaku-ji Golden Pavilion, and practice meditation in Daisen-in's Zen rock garden. Day 7: Kyoto/Hakone(1D) Take a cable car up Mt Owakudani for views of Mt Fuji, a boat ride on Lake Ashino-ko, and a walk along the Old Tokaido Highway. Enjoy a stay in traditional ryokan accommodation, feast on a Japanese multi-course kaiseki meal, soak in the natural hot springs, and sleep on a futon. Day 8: Hakone/Tokyo(1B) Head to Tokyo with time to do some last-minute shopping. Day 9: Tokyo Depart at any time. Small group experience; Max 15, avg 12Hotels (6 nts), mountain monastery (1 nt), Japanese-style ryokan accommodation with hot springs (1 nt). Contact one of our Adventure Specialists today for more information!